If you buy season tickets, you get a discount and have a chance to choose your favorite seat. Five concert packages receive a 20% discount, four concert packages get a 15% discount and if you choose to only attend three concerts a season, you receive a 10% discount. Full-time students get a 50% discount on season tickets. Other advantages to buying season tickets include being able to exchange tickets up to 48 hours in advance of a concert, getting the same discount if you want to buy additional single tickets for individual concerts, if you lose your ticket, we can replace it and last, but not least, your seats are held for future season renewals (we know how some people like particular locations from which to enjoy the music). For those who don’t want to commit early, we offer what we call “Rush” tickets. If you have cash on you, you can purchase tickets at the door one hour before the concert—Student Rush tickets are $10 and Adult Rush tickets are $15 for remaining available seats for that concert. Can't commit to season tickets but want to be sure you or your friends and family do make it to the symphony "some time" during the concert season? Buy a Flex Pass which offers 10 Flex tickets for $110. Those 10 Flex tickets can be used on any symphony concert night in any combination you find useful, like making it an occasion where you and 9 friends all attend one concert or you can spread your concert going throughout the season. Use the tickets on your chosen night one hour before curtain for the best seats available. Contact the Ticket Office at tickets@eurekasymphony.org for purchase. Good news for parents! Children aged 5-12 are admitted free, 2 children per paid adult ticket. So if both parents pay to attend, that means 4 children can get in free. The earlier you arrive, the easier it is to find a place to park either on the street or in parking lots. There is a parking lot directly across from the Arkley Center for the Performing Arts, plus two other public parking lots on 3rd Street between F and H Streets. When does a concert start and how long will it last? Concerts start promptly at 8:00 p.m. and typically run 90-120 minutes depending on the pieces in the program that night, including an intermission. What do you feel comfortable wearing? This is Humboldt County, so while many attendees take advantage of the occasion to dress up, you will also find other people dressed more casually. No one will be judging you, we are all here for the live music experience! Can I buy a drink or a snack at the venue? Yes, you can buy wine, soft drinks and cookies at the main level bar prior to the concert and during intermission. However, we ask that you finish your drink before entering the concert hall. There are also water fountains in the lobby. That’s a good question! There are two single restrooms in the main lobby behind the concessions stand, but there are two other restrooms with more stalls available on the floors above and below the main lobby (stairs to both are to the right as you come into the lobby from the street, past the ticket office. Where can I learn about the music played in the concert before I go? You can do a little bit of your own research online, since the pieces to be played at each concert are listed on the website. However, if you enjoy a more personal touch, we offer a free Musical Notes lecture at 7:00 p.m. prior to each concert. The lecture is typically hosted by concertmaster Terrie Baune and pianist John Chernoff, but sometimes other guest artists join in. You will learn about the composers and pieces to be played that evening, plus fascinating facts about the era and its music. What exactly is a concertmaster or principal? Another good question. A principal is the leader of the group or section of musicians playing a particular instrument in the symphony. They are responsible for leading the section and playing solos. You’ll note that violins in the orchestra are typically divided into two sections called first violins and second violins. The concertmaster is the principal for the first violins and makes decisions about bowing and other technical details of string playing, but is also responsible for leading all orchestra sections in tuning before rehearsals and concerts. The concertmaster also helps with other technical aspects of managing the orchestra. Why does the conductor stand up there waving a stick? First off, that “stick” our conductor uses is called a baton. 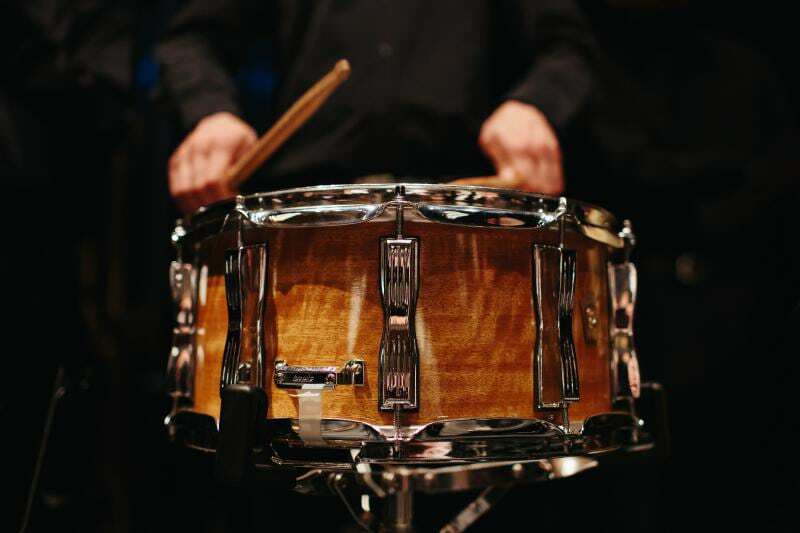 The conductor’s movement of the baton communicates many things to the musicians, including tempo, tone and whatever other guidance they need to play the score. 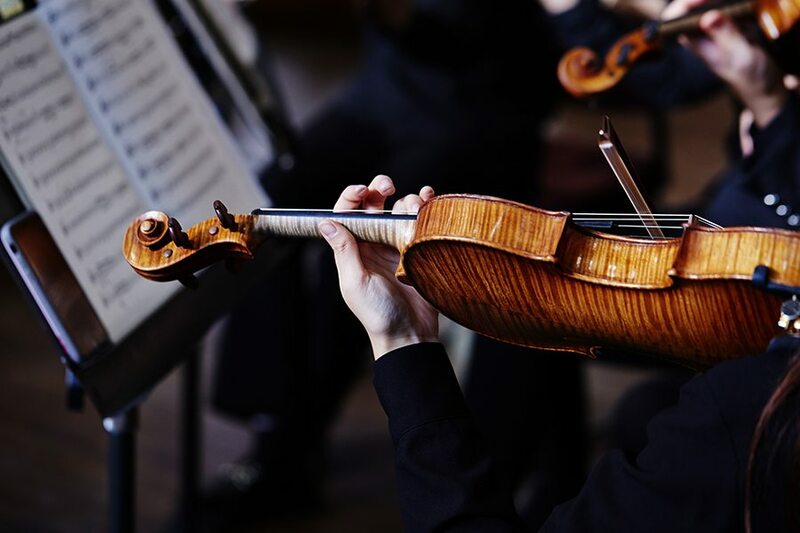 While the concertmaster and principal musicians are leaders in their sections, the conductor is key to bringing the music and the musicians together to make a spectacular and moving performance for the audience. Without a conductor, each musician would likely go their own way and the result would be a cacophony. 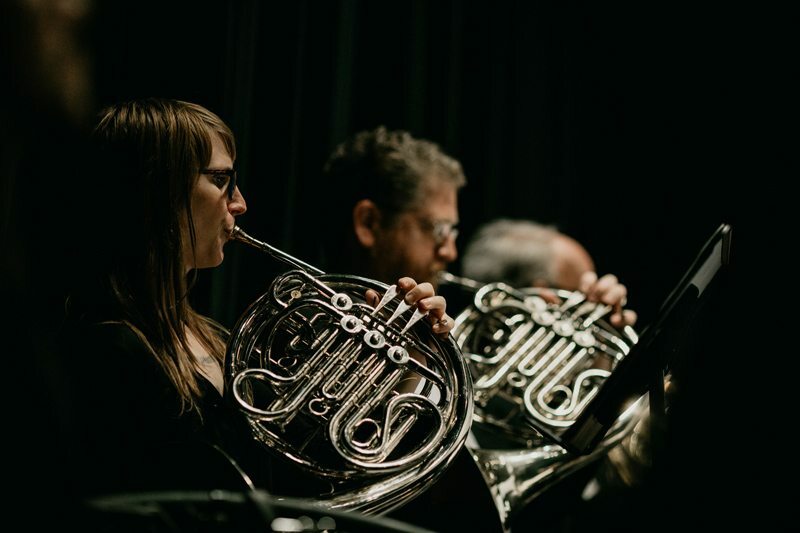 The conductor’s role is to interpret the score, prepare the musicians during rehearsals to get the most out of the music and lead the musicians during the actual performance. Note that in addition to the baton that you see, the conductor will also use other hand gestures or signals as well as eye contact with different performers throughout the symphony to give instruction to the musicians. Is that really a question? Long ago, classical music audiences were rowdy and would clap and talk during a performance. In the 20th century, audiences changed and people started clapping only at the end of the entire piece of music and not at the end of each movement in that piece. While that “no clapping until the very end of the piece” tradition is still in place, no one should feel embarrassed if they clap out of appreciation of the music (or they forgot which movement just ended). Please turn off your cell phones during the concert, even vibrating phones can be heard during quiet moment in the music. If you arrive late, the ushers will seat you following the completion of the first work on the program. No seating is allowed while the symphony is performing. You can take photos before the concert begins, during intermission or after the concert has ended, just not during the performance. If you get a good photo and want to share it, don’t forget to tag the Eureka Symphony in it! Our orchestra members are local. More than 50 musicians travel from all parts of Humboldt County including Garberville, Fortuna, Eureka, Arcata, Trinidad & Willow Creek – and one from Redding! Each musician devotes about 150 hours each year to rehearsing and performing concerts – in addition to personal time spent practicing and learning music! Each year we partner with the Humboldt County Office of Education to offer school children a free concert with free busing, during the school day. Over 1,400 school children attend this annual concert. Small ensembles of orchestra musicians visit 4th through 6th grades to demonstrate their instruments, play short pieces for them and talk about playing music. They also answer questions and encourage students to play and to take advantage of school music programs. In October 2016 we celebrated our 25th year of providing orchestral music for the pleasure of Humboldt County. We commissioned a special symphonic work just for the occasion. Dancing Man Rhapsody was written to feature Terrie Baune, our concertmaster, by a prestigious American composer, Libby Larsen who also spent a week in residence. Our relatively new chorus made its debut in December of 2015 and thrilled audiences. During our 2017-2018 season finale, the Eureka Symphony Chorus electrified the symphony-goers with its performance of Luigi Cherubini’s Requiem in C minor. The chorus will be back this season, uplifting all with Handel’s Messiah. An hour before each concert there’s a free informal lecture about the music, the composers and the historic time in which the music was written – presented by our concertmaster and another fine musician. Modest ticket prices & exceptional quality. Main floor seats start at just $19. There is also a 10-ticket Flex-Pass for $110. These tickets can be used all season long. And kids 12 and under are FREE when with a paid adult. 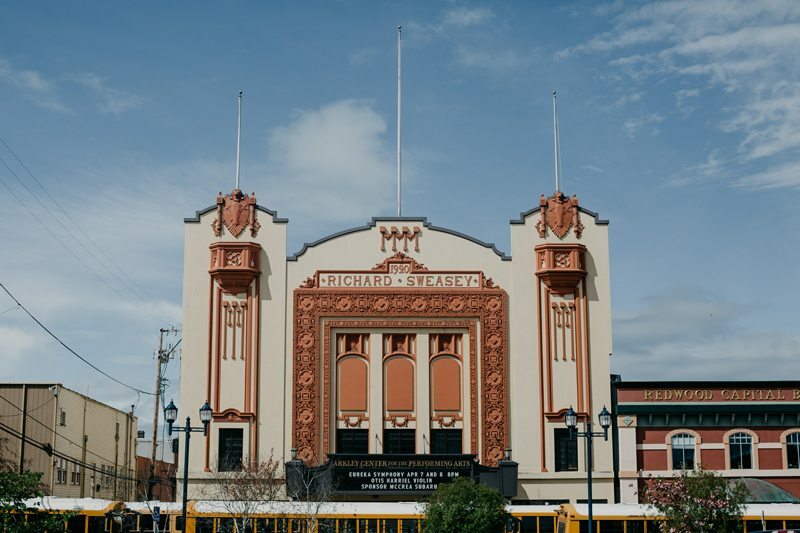 Our home is the Arkley Center for the Performing Arts, one of Eureka’s architectural treasures. Generous donors and the support of businesses make it possible to offer outstanding live classical music, education and outreach programs right here in our own community. Enter Eureka using US-101 N, continue straight on Broadway for 2 miles until it turns slightly right and becomes 5th Street, continue on 5th Street for a half mile, turn left on G Street. Enter Eureka using US-101 S, continue straight on. 4th Street for 1 mile, turn left on G Street. The parking lot is located directly across from the Arkley Center, but space is limited. Additional lots are located at 3rd and G Streets. Street parking is also available. Wheelchair accessible seating is available for the Arkley Center for the Performing Arts and may be ordered online, in person or by phone. These seats are clearly marked with a handicapped symbol on our website seat selection tool. There are no elevators to service the upper theatre levels. All seating in the Orchestra section will accommodate patrons who are unable to climb stairs. Ushers are available for seating assistance. For assistance, please contact our Ticket Office at 707-845-3655.